John Kenneth Muir's Reflections on Cult Movies and Classic TV: Saturday Morning Cult-TV Blogging: Godzilla: (1978) "The Horror of Forgotten Island"
Saturday Morning Cult-TV Blogging: Godzilla: (1978) "The Horror of Forgotten Island"
In “The Horror of Forgotten Island,” the Calico passes through an ancient force field during the approach of a comet that passes Earth only once every nine hundred years. On the far side of the force field the crew finds an island guarded by a giant Cyclops. 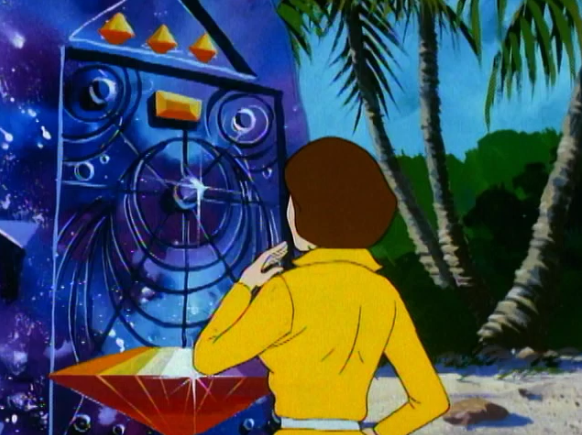 While investigating, Quinn, Brock and the others learn that aliens visited the island and encountered the monster there generations ago, and erected the force field to keep it isolated from the rest of the planet. 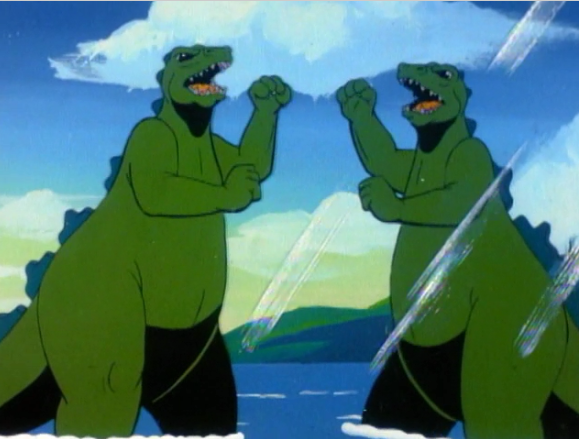 Now the Calico crew needs Godzilla’s help to defeat or trap the Cyclops, and put the genie back in the bottle. 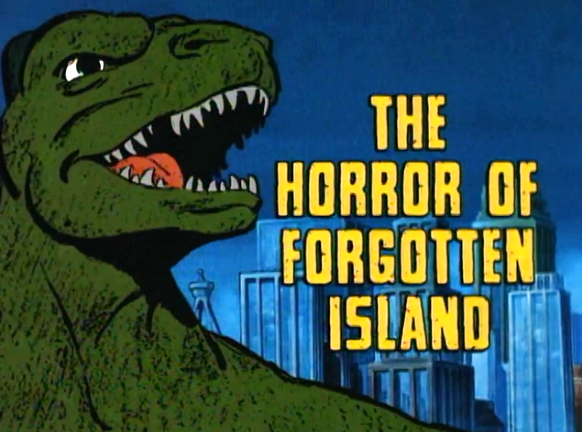 “The Horror of Forgotten Island’ is a little less successful than the previous episode (“Colossus of Atlantis”), but gets by with some nice, unexpected tension in the final act. In short, the Calico and Godzilla must trap the Cyclops inside a force-field, but simultaneously escape that very force field. This task is complicated by the fact that the Cyclops can turn itself invisible at will. At one point, it looks like Godzilla and the Calico are home-free, evacuating the island, when the monster shows up just in time (with three minutes to go…) to cause grief for Godzilla. Godzilla tosses the monster back to land (a great coup de grace) and then high-tails it to sea, just in time to escape being trapped forever (or at least another 900 years) by the force field. It’s funny to state that a kid’s cartoon is suspenseful, especially since some part of you knows that Godzilla can’t get trapped (because the series end…). Yet buttressed by the ticking clock countdown, and the climactic final battle, the episode manages to be pretty exciting. The only disappointment may be the monster here, which looks goofy rather than legitimately threatening. 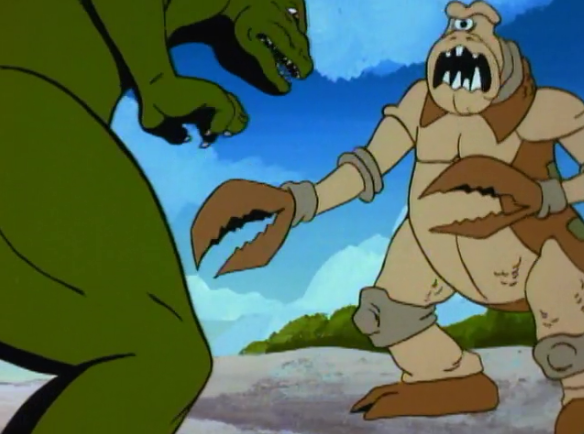 The creature is a giant Cyclops with buck teeth and crab pincers, and it has a kind of dopey countenance. You don’t want it to escape the island prison, but it’s also kind of sad that the pitiable monster gets trapped on that island all alone for the rest of its life.